Photography is an interesting niche market for a collector to become involved in. It affords the collector the opportunity to build a substantial collection at relatively low cost should they wish. In fact, should a collector want to build a substantial body of images purely for aesthetic value, recent major changes in photographic technology make photography the ideal medium to collect. Low cost, high quality digital printers enable the fast and effective printing of photographic standard prints from computer databases, and indeed, directly from a camera in some cases. This makes the sharing of photographic prints over the internet or directly with friends and associates relatively simple. This in itself points to major changes across the creative industries that may well herald a new dawn in the production and reception of art. This can be most readily seen in the music industry, where downloading and exchanging music legally and illegally over the internet has made for a wide exchange of varying forms of musical output. However, similar changes in the arts as whole are starting to take place, with the internet becoming a major hub for arts communication. This ultimately signals a situation whereby video and digital imagery can be shared across the net with no need either for the producer to be well known, or the collector to be well connected. Taken to its conclusion the end result of this would be a society where all persons are equally capable of producing and obtaining art. With the huge popularity of cameras on mobile phones this is already becoming a reality. Many people now taking pride in amassing collections of both their own and their friends’ photography. Interestingly, this needn’t even be printed and displayed as computers and I-Pods offer ideal facilities for viewing images. This is, in a sense, one form of the public taking control of ‘art’ in a way that artists have dreamed of since the beginnings of modernism. The gallery may no longer be the centre of our visual culture. Whilst these changes occur, the traditional collection of photography by established and highly skilled photographers continues, with some galleries being dedicated to the display of photography. The Photographers’ Gallery in London (WC2) is one example of such a gallery, committed to promoting the importance of photography as a skilled creative pursuit. It is worth considering that photography had to strive hard to be considered as a Fine Art process on a par with painting, sculpture and printmaking. It will be interesting to see to what extent professional photography passionately defends this position if it is gradually eroded by the onslaught of amateur photography! It is, in any case, unlikely that the growing popularity of amateur photography will damage the professional market and may, in fact, make it more popular as a pursuit as photography becomes ever more present in society. It must be noted that there is something to be said for looking at (and possessing) a very high quality photographic print. The level of compositional technique together with the level of ‘finish’ on a professional print has a certain lure of its own. 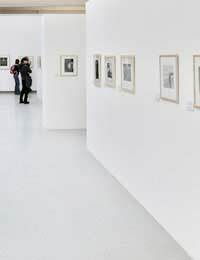 Should you wish to pursue the collection of professional photography, the Photographers’ Gallery would be a good place to start, as they operate the ‘Own Art’ scheme making purchase easier. Whether you choose to collect photography for yourself, and with little regard for the market, amassing photos from friends and the internet, or whether you wish to collect the work of professionals it is well worth considering photography as a viable alternative to other art-forms. If you are buying photography you should expect to pay something in the region of £50 - £1,000, the price mainly reflecting the standing of the artist. Factors affecting the price of the print may include how many of the print were made, whether it is signed and how long after the development of the negative it was printed (if indeed a negative was used).